High Cost of Squelching the Instinct to Innovate | Dynamynd, Inc.
For years many educators and physicians have recommended drugging risk takers. Kids who naturally initiate innovation were told they shouldn’t act that way. Now, there’s a national conversation asking where they went. The Wall Street Journal reports the American risk-taking spirit appears to be fading, noting that Americans start fewer businesses. John Haltiwanger, a University of Maryland economist who has studied the decline in American entrepreneurship said, “The pessimistic view is we’ve lost our mojo.” What we’ve lost is a tolerance for a particular M.O. (modus operandi). The pattern of conative instincts that leads to entrepreneurial efforts has been badly abused. 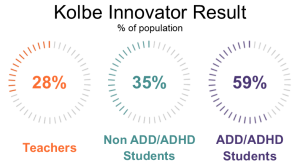 Ever increasing quantities of kids have been labeled ADD/ADHD and given meds to keep them from distracting others. This has not only robbed them of opportunities to learn to self-manage their instinctive strengths, it has kept these misidentified talents from blossoming naturally. Our culture is beginning to notice the absence of their innovative energy. We’re paying the price for the unintended consequences of dulling the minds of those who would now be leaders in changing the status quo. So many parents are told: “Your child won’t conform to the system we have in the classroom. He’s being disruptive. We have to change the way he acts.” It is not about helping him or her use these abilities to create change in productive ways. It is an attempt to keep those behaviors from interfering with current classroom procedures. By labeling them “disabilities,” schools not only dull the uniqueness, they get extra funds for doing so. Now these non-conformist kids’ abilities are MIA in the workplace. Now we recognize the loss of the creative disruptors. Now, just maybe, more educators (and corporate trainers) will be open to the reality that trying to make every student do things one way is not the best way to get the results both the kids and society needs. I’ve never lost hope that leaders in education and medicine would realize this mistake. It’s logical that the evidence would come from the world of work, where all of the natural conative strengths are essential to bottom line performance. Data I’ve been collecting (with the help of enlightened educators) regarding conation and disabilities may now be recognized as relevant. So I will, with the help of these educators, offer it for public discourse over the coming months. Kids whose innovative instincts have been pathologized have suffered from the lack of freedom to be themselves. In a society that says it values freedom, this loss of freedom for many of our children is unacceptable. It is embedded in our standardized testing programs and strongly influences university and corporate selection criteria. It is a national disgrace. In order to have innovation in the workplace, we must free all kids to be who they were created to be.